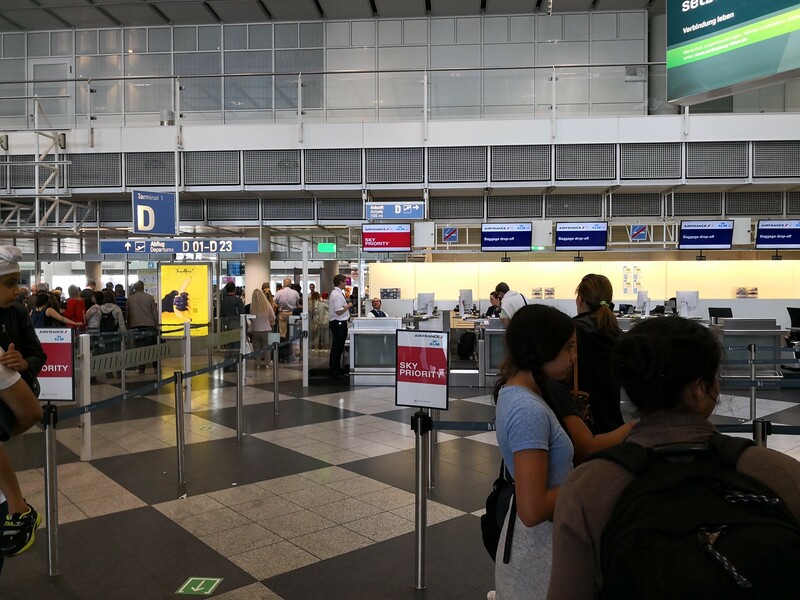 I had arrived at the airport about 4:10pm via the Lufthansa Airport Bus and was dropped off at Terminal 1 before I made the trek over to the KLM check-in counters. With one passenger being served in the Sky Priority queue, I was served in the baggage drop-off counters next to the Sky Priority line. However check-in took a while as there was some problems in printing out the luggage tags. 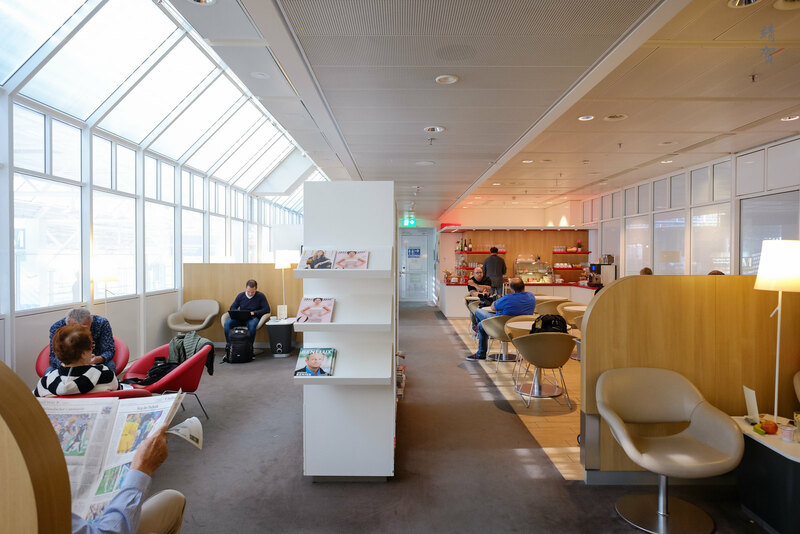 After handing me the boarding passes, I was told I could wait inside the Air France KLM lounge past security and that my Sky Priority status would entitle me to fast track security processing. A short and painless security check later, I was through to the airside and what a difference Terminal 1 and 2 in Munich was. 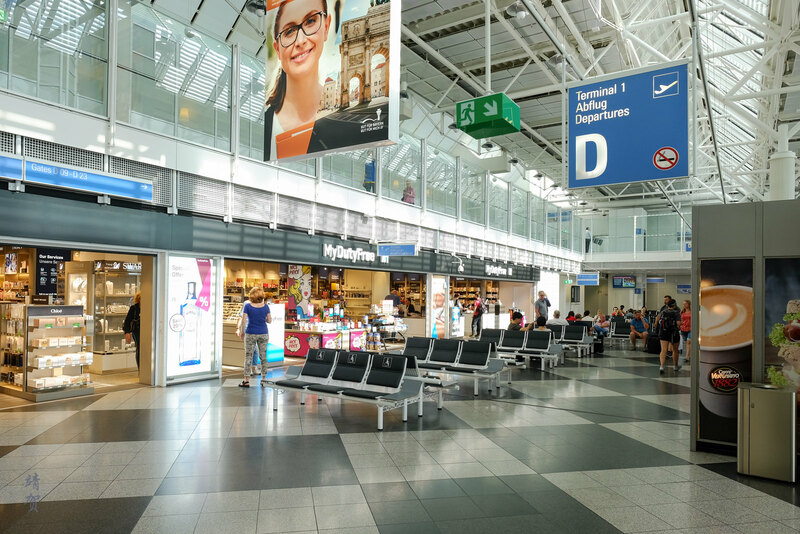 Terminal 1 is small with only a few shops on the departure concourse and there was definitely overcrowding at the gate areas especially if the flight is full. 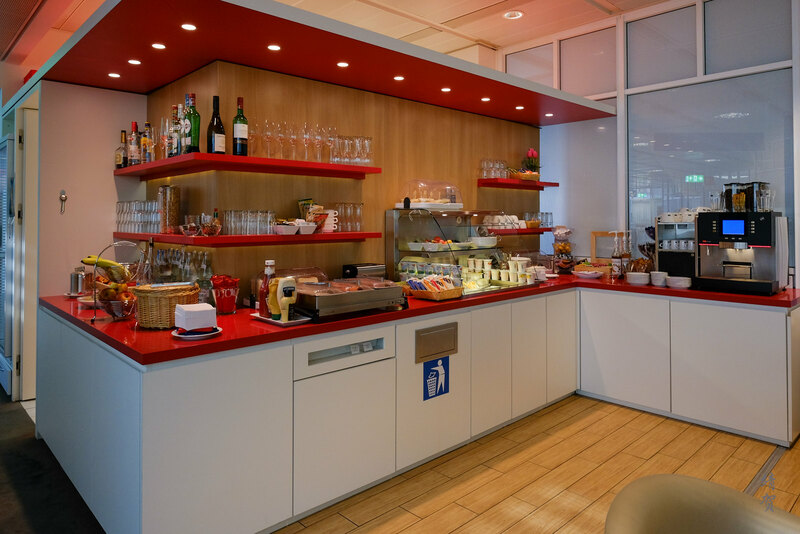 Located in level 5 of the D concourse in Terminal 1, the Air France lounge has an unassuming exterior. 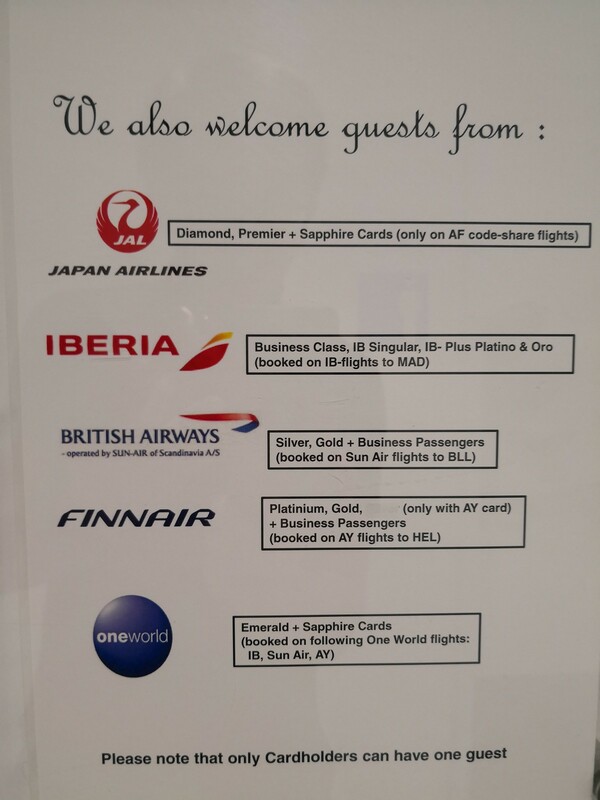 This lounge provides access to Sky Team flyers as well but what was interesting was a number of oneworld flyers can gain access to this lounge as well with the rules posted by the door. 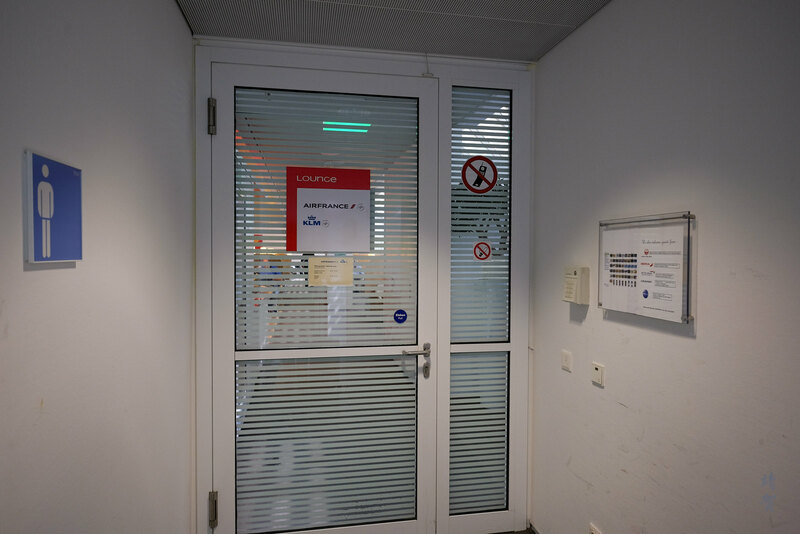 On the right side by the door, there was a reception desk with a TV screen displaying flight information details. By the ledge was a platter filled with Mentos mints and candies. Inside it was a relatively small space with most of the lounge visible from the entrance. 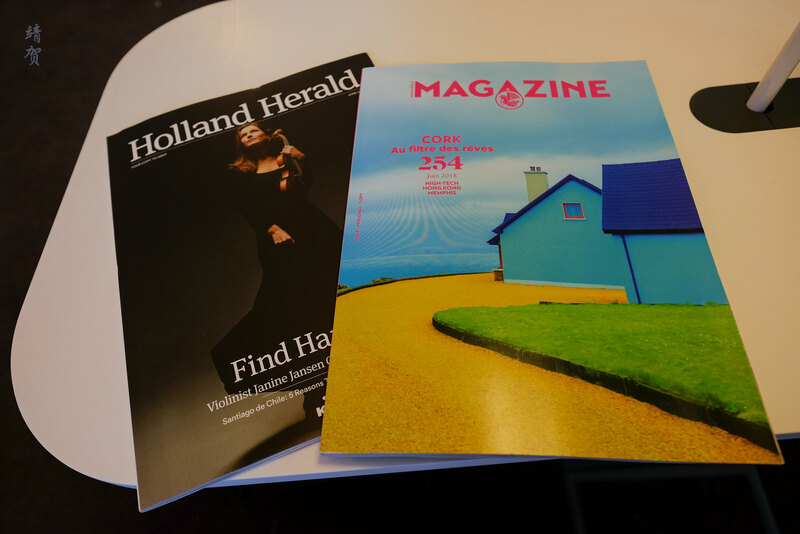 For guests needing to use washrooms, they can be found outside the lounge. 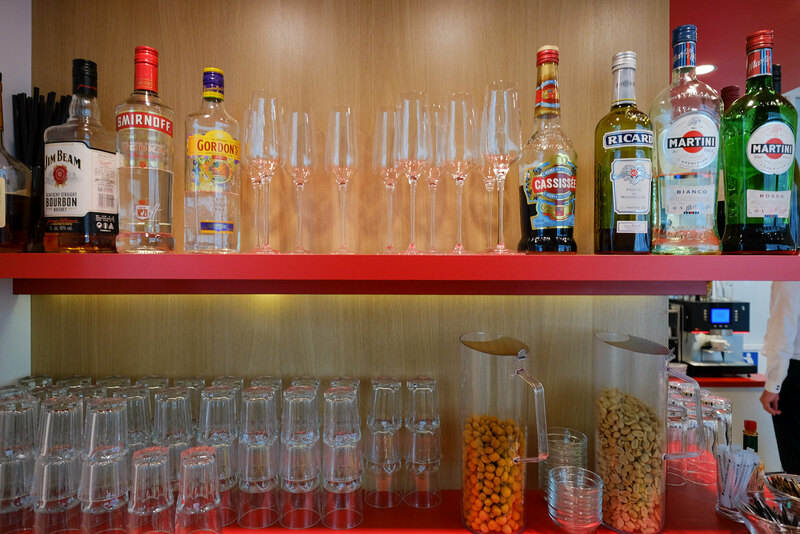 The snack and food buffet was located on the left side of the lounge. 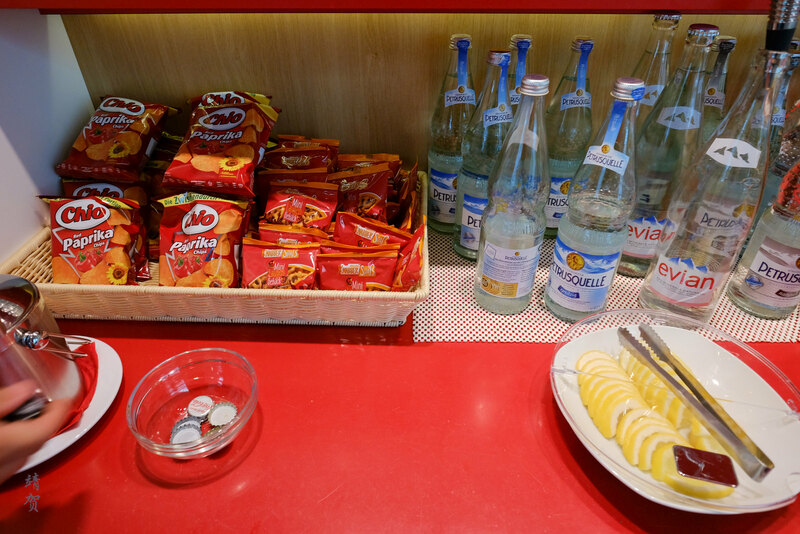 First section on the buffet was packet chips and pretzel snacks with still and sparkling water from the glass bottles. Nuts were placed inside jugs so guests could pour them out easily onto small ramekins while alcoholic liquors were placed on the upper shelf. The next section has boiled sausages and bread with a toaster placed next to it. 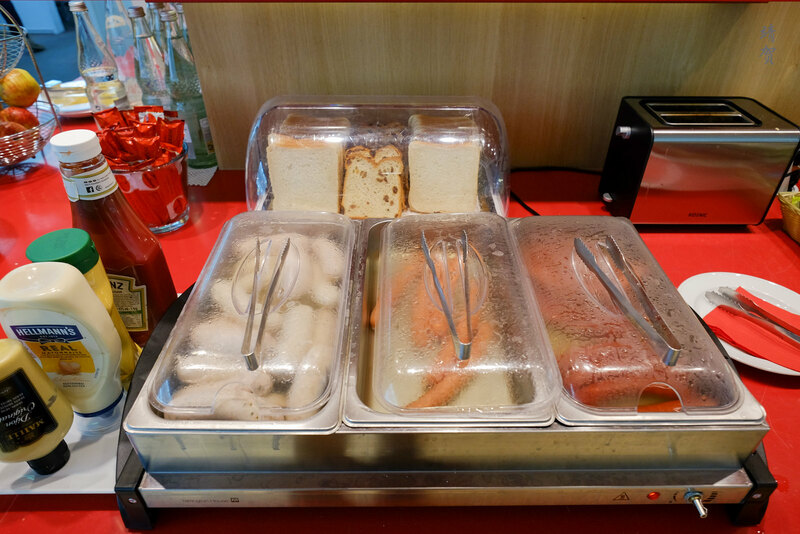 In the cultural context, boiled sausages seems to be common in lounges within German airports. A salad bar with yogurt, potato salad and sauerkraut comes next. 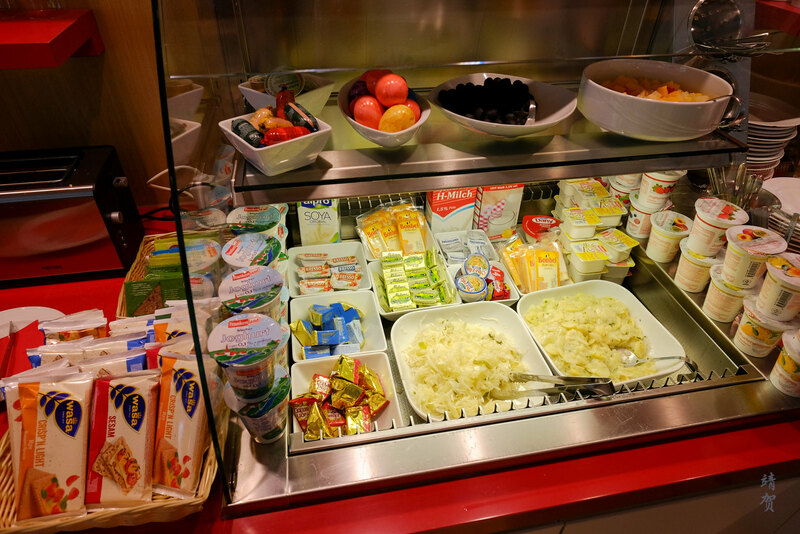 Fresh fruits can be found above the salad bar while there was packaged biscuits next to it. 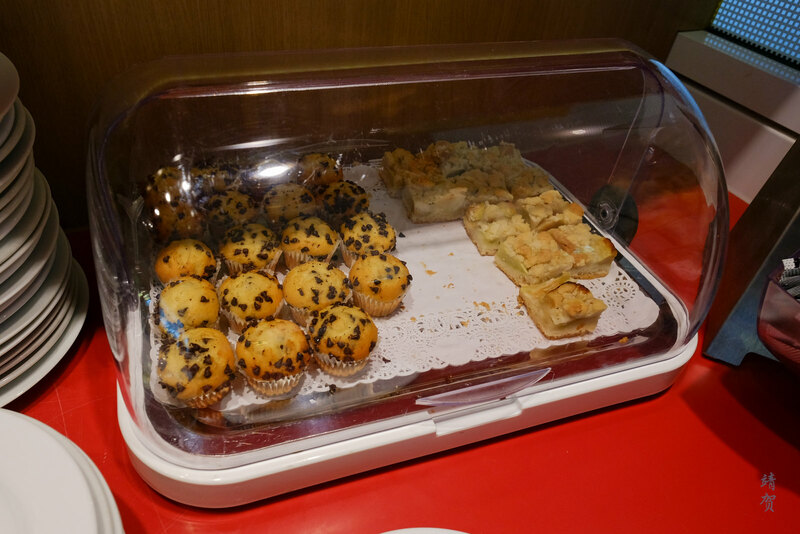 At the end of the buffet table was a tray of muffins with energy bars in a basket placed above the shelf. Guests could find coffee and tea cups along with assorted tea bags and hot chocolate packs to make their own beverage of choice. 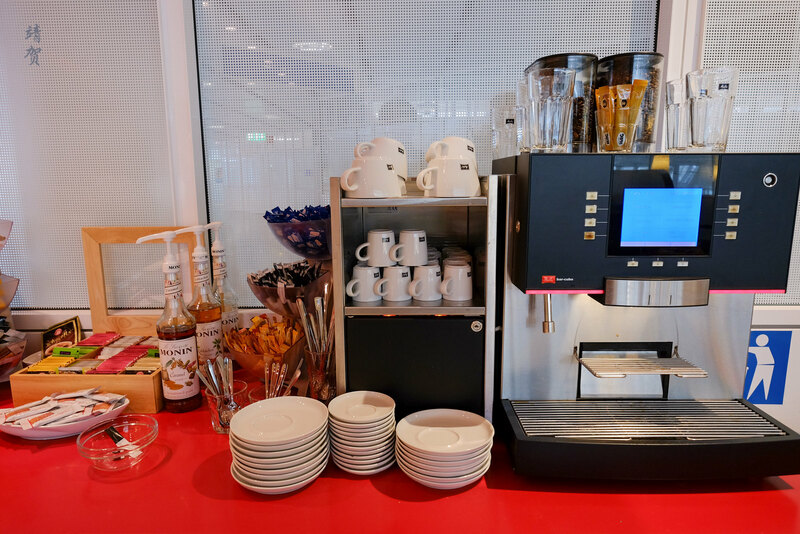 An espresso machine is located here and there was various syrups to sweeten your latte or plenty of condiments to create that special cup of coffee. 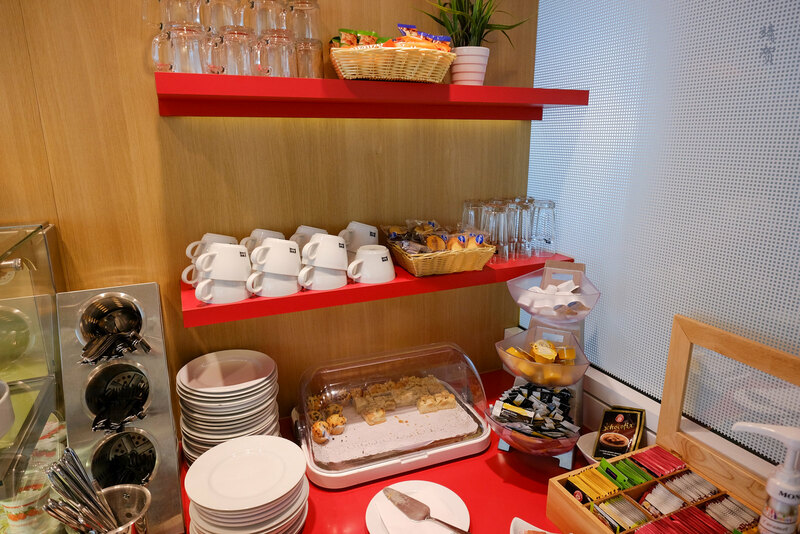 The buffet corner was adequate for a small lounge and while the selections were not extensive, they were quickly replenished and the small space was kept clean. Next to the buffet corner was a dining area with tables and chairs like they were from Ikea. However the dining area was quite full when I arrived so I head further inside the lounge. Next to the dining area was a TV lounge that was showing the World Cup with all the seats occupied. These 2 sections were in the front of the lounge closest to the door which could also be the reason why they were most crowded. 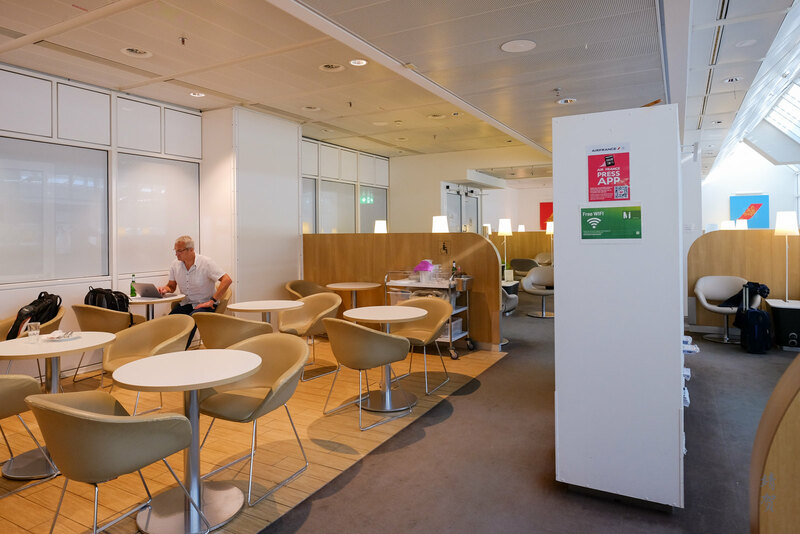 Most of the seating spaces here are well partitioned so it can function as a medium sized cubicle for one group to socialize with each other. Power outlets were easily accessible underneath the side tables that were placed strategically between armchairs in the lounge, and there was enough for those guests seated down. 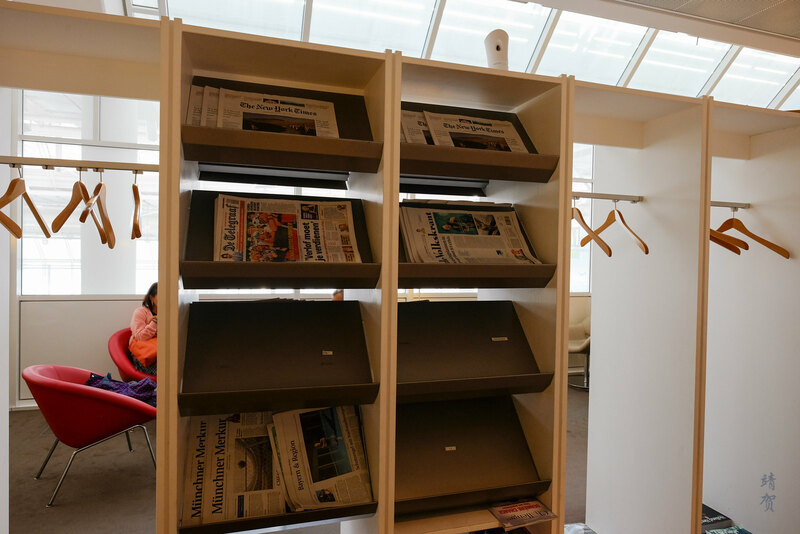 There was a coat rack with magazine shelf in the middle of the lounge. 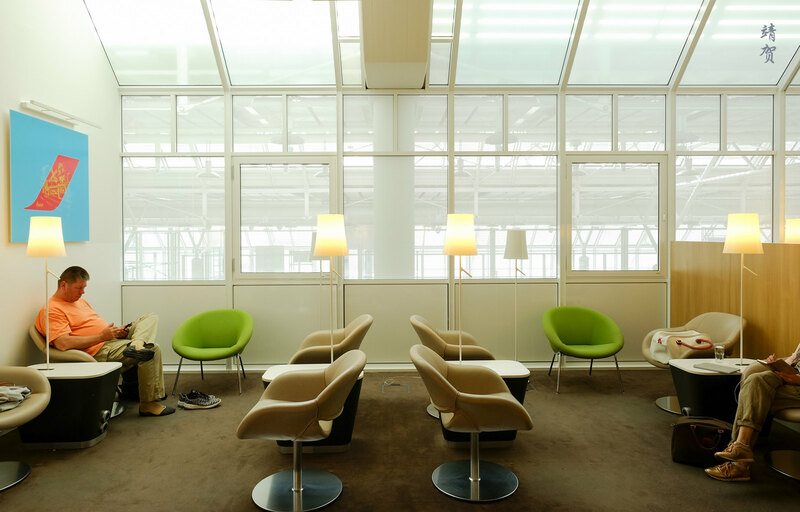 This acts as a partition as well between the space in the lounge. 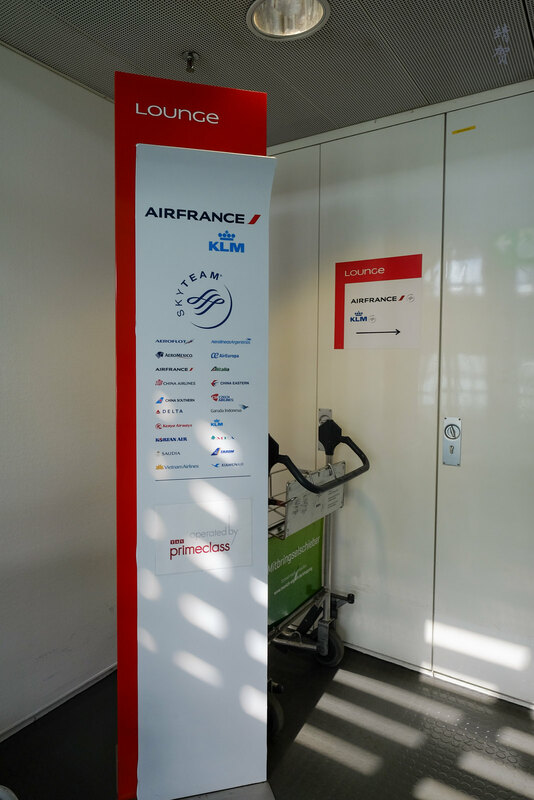 Next to the coat rack, there was a small corner with the label being ‘reserved for Ultimate’, which I am guessing is the highest VIP group in the Flying Blue program. 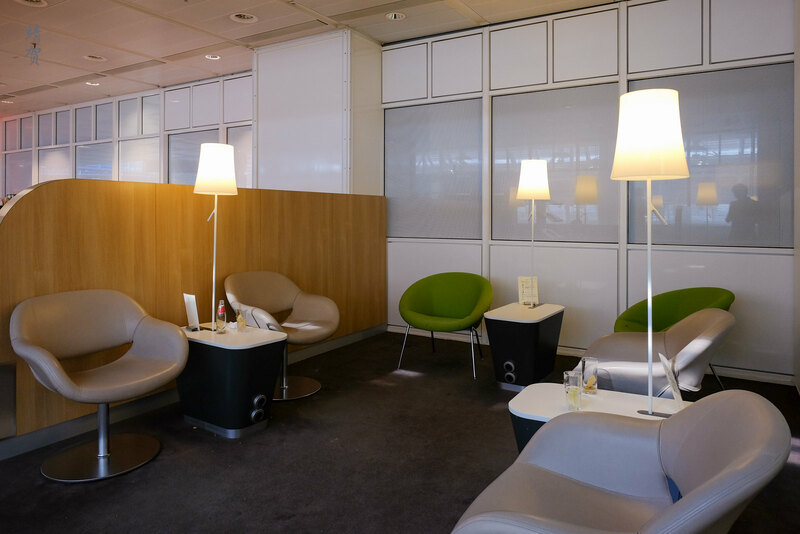 For a small lounge, they actually receive some natural light from the terminal as it is located above the departure gates and due to the airport’s use of glass for its roof. 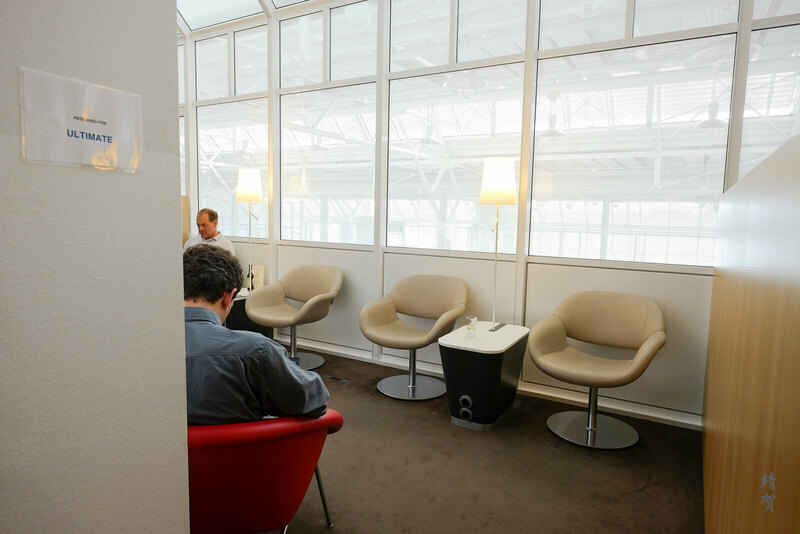 This made the lounge bright enough in the afternoon and it was a slightly better space to hang out in rather than by the gate area. Boarding for my flight was initially delayed by 15 minutes but by then there was really nothing much to do in the lounge so I decided to get down earlier via the elevators to take some shots of the plane that would take me to Amsterdam.